The Civilization VI Fall 2016 update goes live today. It adds DirectX 12 and Logitech ARX support, plus two new map types, a new multiplayer scenario, balance changes, AI tuning and fixes for a whole host of bugs and exploits. If you didn’t totally ruin a game by playing Tomyris and spamming cavalry to sell, looks like it’s too late. 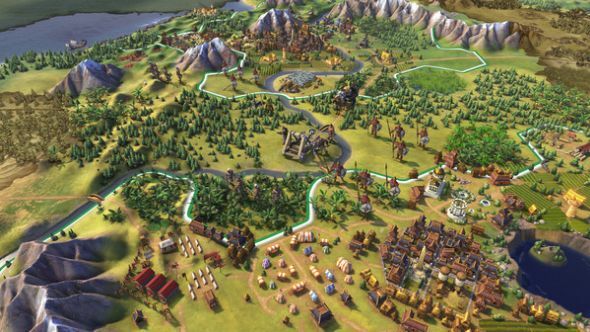 Civ 6 is good, but how good? We compare it to the only fair competition – its predecessors – in our definitive ranking of the Civ series. The update will install itself automatically when you start Steam. Read on for a full breakdown of what’s included. The update adds two new map types, ‘Four-Leaf Clover’ and ‘Six-Armed Snowflake’, which are balanced for four and six players. These will be symmetrical, competitive maps with several starting zones clustered around a resource-rich centre – ideal for incentivising conflict in a multiplayer game, but also playable offline. The ‘Cavalry and Cannonades’ scenario is added to multiplayer. This is a combat scenario with reduced unit maintenance costs, no strategic resource requirement for units, and which grants a larger starting army and more techs. The goal is to get the most territory after 50 turns. DirectX 12 and Logitech ARX support have been added, so make sure your drivers are up to date. A number of nice quality-of-life additions, such as new hotkeys and a notification for Barbarian scouts that have seen your city. Some requested features from Civ 5 also return; you’ll now be able to see the next tile a city will claim through culture, and can rename cities. Added a “time defeat” for running out of time. This is always disabled if a Score Victory is available. Big tweaks here to squash the many exploits that emerged within days of the game’s release. Units no longer give any gold at all when deleted, meaning buying and selling armies or armadas, or spamming light cavalry as Tomyris, is now pointless. Cavalry production policies in general are less effective, indeed. Builders can no longer remove features from tiles outside your territory, so you can’t send them all over the map removing forest to boost production in your cities. There’s also been a reduction to warmonger penalties “in most instances” – welcome, as in our experience fighting wars in most eras still carries too-harsh diplomatic consequences. Barbarians will now spawn further away from players on lower difficulties, and the AI won’t accuse you of waving your troops in its face when it settles a city NEAR MY OWN BORDER CATHERINE, DAMMIT. These AI adjustments should mean your robo-rivals are more willing to make peace when they’re clearly outmatched, rather than pointlessly dragging out wars or starting foolish new ones. They’ll be less inclined to compete militarily – but should be more effective when they do – and will choose more often to contest the science or tourism victories. If that sounds familiar, it should now be a thing of the past. Trade route yields will also no longer randomly double, which takes some of the wind from Rome’s sails, while England gets a “buff” in that their unique district gets its proper adjacency bonuses now. Other highlights include the proper transference of wonder ownership with city ownership, and bringing civs into the game properly when they are liberated “back to life”. A couple of purely aesthetic touches. National Parks get a ranger tower, which is cool. Next addition: a tiny bipedal bear in a green hat and tie. Please, Firaxis. There’s no single huge change here, but you’ll notice the collective effect of the below within a few turns when you load back in. There’s just a bit less friction in all things, as many keys you’ll press intuitively now do the thing you were expecting, and more information is where you’re expecting it to be. Added a setup option “No Duplicate Leaders” that is enabled by default. This option prevents multiple players from selecting the same leader. Updated leader screen to support enabling/disabling bloom according to the ‘Enable Bloom’ graphics option. Thanks to Firaxis via the Civ 6 blog.